Challenge 101 is a new series on my blog that I would love to try and do. Basically, these series is all about challenges. I challenge myself to do something to see whether it works on me or not. There will be a time limit of every challenge. So we will know if I can it or not. 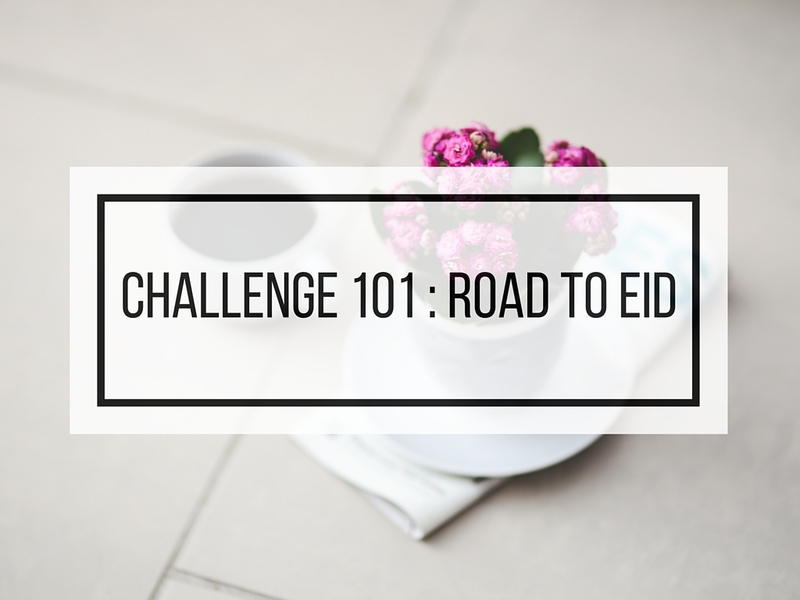 Since Eid is just around the corner, I want to challenge myself to do something that is not so important but still a must to take care to. Can you guys guess what it is? I was just thinking to lose some of my weight. To be honest I'm truly okay with my weight. I don't really put much attention on it but as for now I just want to challenge myself whether I can do it or not. Perhaps I can. I was thinking about this when I was about to know my current weight since I have been not doing that for such a long time perhaps 5 months already. My weight as for now is 54.9kg (I took it as 55kg) which is normal for my BMI I think. I was not surprised about my weight but a bit happy because the amount has been reduced from the last time I did. So for my first challenge on these series, I wanna lose weight for about 5kg before Eid. Sounds ridiculous, right? I know it is hard to achieve but why not to give it a try and challenge myself, right? Whether it works or not, that is another story at least I tried. I always wanted to have a tight gap cause I never have it. I'm so jealous of someone who has the small and thin leg. Trust me they are so lucky. Regarding of that, I will do 'something' to make it small and thin too. Maybe a bit of exercise and massages will do. We will see. This challenge will be started from today since until the day before Eid, I will try and challenge myself to lose 5kg. So, I have about 15 days to make it come true. Hopefully, it works this time cause I still remember the last time when I decided to exercise and guess what? It's only long for 5 days only then I quit. Haha. But let's say I cannot make my weight reduce to 5 kg, it's okay then. Even 1 kg is fine cause at least I succeed to challenge myself to do it, right? I will update from time to time about this challenge. Please look forward to that. And wish me luck, guys! I really really hopes I can make it. But we will wait and see the upcoming results near to Eid, okay? you can do it :) but don't forget to keep the normal BMI.